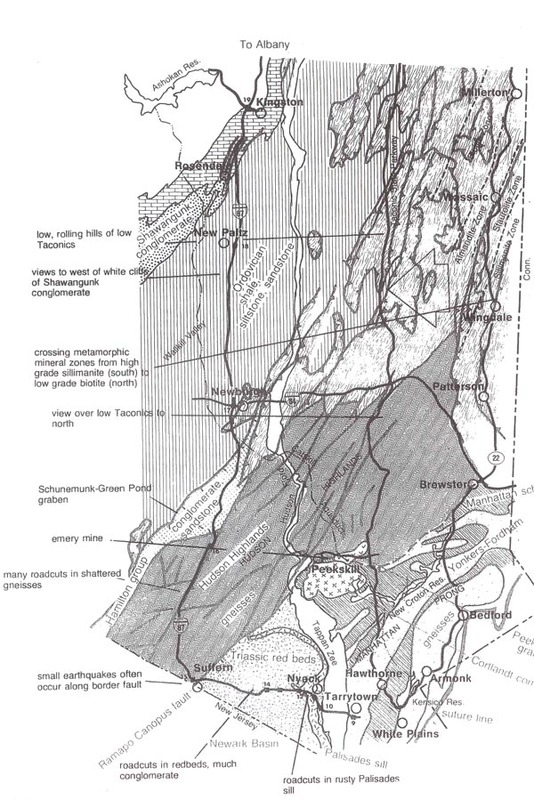 I went on a field trip with my Structural Geology class (SUNYSB) in 2001 and Professor Davis passed out a collection of notes and diagrams for reference on the trip. Since I travel the Thruway often, I have carried these notes with me several times for reference to some of the more interesting roadside Geology along that highway. Some of the notes are for a side trip out Route 23, but I have included the text anyway. The first part of the trip is on Long Island, in glacial sediments. This is a very good time to sleep. If you are awake for the scenic Cross-Bronx Expressway, note the combination of ductile and brittle deformation. We start out in the Precambrian Fordam Gneiss (over a billion years old). It is rather dark colored and sometimes banded-Iooking. It shows intense ductile folding, which occurred when it was deep. However, it also shows later brittle fractures (lots of joints) that occurred when the rock was shallower. We also see some of the Manhattan schist, a 500 million year old dark sparkly-looking rock that formed by the metamorphism of shales at moderately large depths and temperatures, with later brittle fractures. In Yonkers, we pass through the Yonkers Gneiss. It is about the same age as the Fordam Gneiss, but lighter colored ( often rather pinkish in hue), with both older ductile and younger brittle deformation. Before the Tappan Zee Bridge, we see more Fordham Gneiss. Across the river, we enter the Palisades diabase, a dark colored Triassic intrusive rock that intruded into older Triassic sediments primarily as a sill (horizontally). It was originally about 300 m thick. Most has eroded away, but the bottom 50-100 m forms the ridge of 'The Palisades' along the west side of the Hudson. Note the amazing columnar jointing, which occurred as part of the cooling of the sill. Near exit 12, we leave the Palisades diabase sill and enter the sediments into which the sill is intruded. There is a good outcrop near the exit 14 tollbooth. These Triassic sediments are mostly red beds (red because of iron oxides in the rock). They were deposited in a normal-fault bounded rift basin (the Newark Basin) about 200 million years ago as part of the breakup of Pangaea and the birth of the Atlantic Ocean. Except for a few lava flows, we are in these sediments until exit 15, near Suffern. The appearance ofhigh topography near exit 15 marks our leaving the down-dropped hanging wall of a major normal fault (the Ramapo Fault, which extends northeastward past a point beneath Con Ed's Indian Point nuclear power reactors). We now enter the footwall, which consists of the erosion-resistant Precambrian gneisses of the Hudson Highland. Look for more ductile and brittle deformation. REST STOP AT THE SLOATSBURG SERVICE AREA. This is not a part of our field trip. However, if you are ready before other people, you may want to look at Precambrian granitic gneiss of the Hudson Highlands complex (1.1 GA). Note the gneissic banding, which is suggestive of a great deal of ductile shear. There is a little bit of ductile folding, plus (much later) joints, formed at much shallower depths. about a mile after exit 16, we enter the Schunemunk -Green Pond graben, which contains sandstones and conglomerates of Silurian & Devonian (roughly 400 million year) age. The opposite-facing normal faults that formed the graben may have occured at around the same time as the Newark basin. Within a few minutes, we enter Ordovician (roughly 450 million year) age sediments, including sandstones, shales, and siltstones. Near exit 18, we can see light colored cliffs to the left (west), the quartz-rich sandy Shawangunk Conglomerate. These Silurian ( ~ 400 million year old) sediments eroded from the Taconic mountains to the east, which fomled during the Ordovician, a few tens of millions of years earlier. We now return to the Thruway and continue northward. We see the Shawangunk conglomerate in the distance to the west and as we approach Kingston, we start to see somewhat younger Devonian limestones. These rocks fomled in a shallow inland sea that was later to be covered by sediments eroded off the plate boundary mountains to the east. Not far to the west is what may well be a buried impact crater, about 10 ~ km across and (possibly) lower Devonian in age. We are now within a small fold-and-thrust belt that we will study for the rest of today and tomorrow. Milepost (111.3-111.4) = Onadaga Limestone at right (east). Note that it is tilted... we are starting to see more intense foldbelt deformation. Milepost (114.5) = Becraft and New Scotland Formations (the fossiliferous outcrop at tollgate is New Scotland. My last trip up the Thruway discovered some innacuracies with the mileposts, or at least we couldn't find evidence for some of the outcrops at the mileposts given. I'll try to get in touch with Prof. Davis for an update sometime. Interested in filling in my list of identified mileposts, I found this document (now links to PDF) very useful by Dr. J Bret Bennington of the University of Hofstra. He has a webpage dedicated to notes on the field trip. Prof. Bennington has some more mileposts which I'll add here since my whole point in putting this up here is to print it out for easy reference when I travel up the Thruway. PP Mile 19.3: Roadcut in Palisades diabase. Mile 26-27: Highway crosses northern margin of diabase intrusive sheet. I87 Mile 47-48: Roadcut in Devonian Esopus Formation (sandstone, siltstone, and shale). Mile 49.5: Skunnemunk Mountain on west side of highway. Mile 53-55: Storm King Arts Center highway exits the highlands and enters the Wallkill Valley. I87 Mile 68.6: Roadcut in Normanskill slate. Note orchard planted on drumlin. Mile 69.3: Roadcut in Normanskill slate. Mile 71: View of Shawangunk Ridge to the northwest. Mile 72.8 View of the 'Gunks at the crest of a hill. I87 Mile 79-81: Roadcuts in Upper Ordovician Normanskill shales and greywacke. Mile 85-90: Roadcuts in Lower Devonian carbonate rock. Mile 106-109: Exposures of Lower Devonian carbonate rock. Mile 109.4: Large roadcut showing banded carbonate rock overlying tilted shales and greywackes. This is the Taconic Unconformity. Mile 110-111: Lower Devonian carbonates. Mile 112-113: Normanskill Shales overlain by Lower Devonian carbonates. Mile 115-116: Lower Devonian carbonates. Mile 118-119: Normanskill shales and greywackes. Mile 120-121: Lower Devonian carbonates showing folding. Mile 123-130: Normanskill shales and greywackes. Exit 21A Mass. Pike: Landscape flattens out as the Thruway enters the glacial Lake Albany plain. by Bradford B. Van Diver is a fantastic resource written for Geology students, but edited to be readable by anyone interested in those rocks whizzing by at 65 miles an hour. As Prof. Davis once said, "...this class [Structural Geology] should be worth points on your license." I was re-reading it recently and decided to create a section here to record my notes from that work (again, as easier reference during road trips). Mile 43 - 47: several low cuts in pale buff limestone or dolostone of the Wappinger group of Cambrian-Ordovician age. Mile 47 - 55: cross the Schunemunk-Green Pond graben floored by Silurian-Devonian conglomerate and sandstone. Near New Paltz, the east-facing Shawangunk scarp rises west of the highway and gradually converges with it from south to north. The ridge is held up by Silurian Shawangunk conglomerate, a white quartz-pebble conglomerate which stands up in vertical cliffs. Rosendale, to the north of New Paltz marks the limit of the conglomerate beds. I've climbed around on the cliffs there myself years ago, and the views are breath-taking. It's a great place to hike. North of Rosendale, 87 begins to follow the Taconic unconformity. Many roadcuts expose greyish Devonian Onondaga or Helderberg group limestones, while others display dark shales and siltstones of the overlying Hamilton group. Kingston is at the edge of the Catskills which is the name given to the topography of the Devonian Catskill delta. The imposing, high scarp of the mountains visible west of the highway called the "Catskill Mural Front" which is the eastern limit of the Allegheny Plateau. Look for evidence of the hard and soft nearly horizontal layers which have differentially eroded to forms a step like appearance.